ICT-Driven Economic and Financial Development: Analyses of European Countries demonstrates the effects of ICT diffusion on economic, social and financial development by examining their impact on the structure and dynamics of national economies. 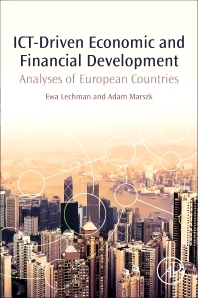 It provides the insight into shifts observed in labour markets, international trade activities productivity factors, education,, and use of innovative financial products. It combines empirical analyses and data sources stretching back to 1990 make it an important contribution to understanding the effects of ICT diffusion on economic and financial development. The book answers questions such as how will national and regional economies react to upcoming ICT developments and growing usage, and what is the magnitude of impact of new information and communication technologies on various aspects of social and economic life.